Over time, I have (obviously) sunk farther and farther into the “finer” details associated with backpacking. It started off with me simply wanting to lighten my load, so one of the first things I began doing was making out gear list. Fast-forward a few iteration’s later, and both my gear as well as my list’s have become both more refined as well as more detailed. But a truly pivotal point came when I started adding in a “Location” column to my list’s. This single, yet simple column has allowed me to start planning out my packing strategy in advance. As I alluded to above, I have found that in order for my trips to be more successful, I need to know where everything I bring is located, whether it be in my pack or in my pockets. But more than just this, I need things to be where I need them, when I need them. To effectively accomplish this takes a bit of preplanning (which my gear list allows me to do), as well as some good ole’ experience. Over time I have found that there are a few things that I prefer to have on my person at all times, rather than in my pack. This is for a couple of reasons. Some items I like to be able to access quickly, such as my map, camera, towel, etc… For me, this does not mean stopping to take my pack off and then digging through it to locate and use these items. I want to be able to simply grab them when I want to. If for some reason I were to become separated from my pack (bear took it, floated down stream, feel off the side of a cliff, stolen, etc…) I will still have some “essential” items on me that I still have access too. Map. I usually can be found on the Appalachian Trail, or in the GSMNP. Another words, on maintained trails. For these trails, I generally either take smaller, printed profile map, or I will print off/copy a section of a larger map and take what I need. By doing this, I typically end up with a small, lightweight map. This makes it very easy to simply stuff it in one of my pant’s pockets. I have started wearing a paracord bracelet on the opposite wrist that I wear my watch on. I like having this extra cord for whatever reason may arise in which I may need a little extra cord, or a buckle of some sort. As well, by wearing the bracelet on my wrist, I was able to drop up to 1 oz from my BPW since I did not have to “pack” extra cord! I also keep my Wa-ben cuben fiber wallet in my back pocket. This is actually my EDC, and yep it has all the same contents whether on a hike or at home. This wallet is quite thin, and I do not over stuff it with junk. It has what I consider to be essentials loaded in it. I prefer not to use a Ziploc bag or what-not with a few cards in it and to just use my regular wallet. Besides, my trips are always less than a week-long, so really, what is the point? If I were to be thru hiking, that would be different… Plus, the back pocket on my pants have a zipper, so I can safely keep my wallet on my person while hiking without fear of losing it. 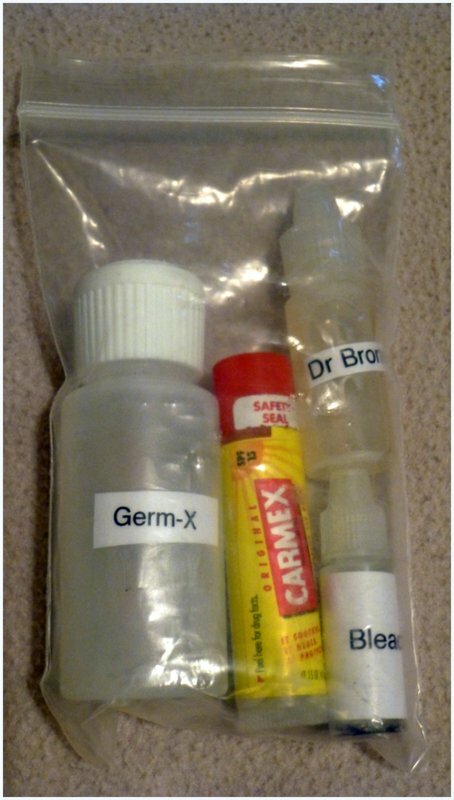 A bottle of Germ-X. This is great to have close by after potty breaks! A bottle of Dr Bronners. This is good to have at hand if I want to actually wash my hands or face. You never know when a good water source might be around the next bend (although I am sure not to “bathe” with soap in the water source). A tube of Carmex for those cold or windy days when my lips are chapped. This is handy to have as I would be using it fairly often. A tiny bottle of Bleach. This is my back-up plan for my Sawyer Squeeze filter. Also, at camp I have started using it to do some of my laundry with. Small button compass. 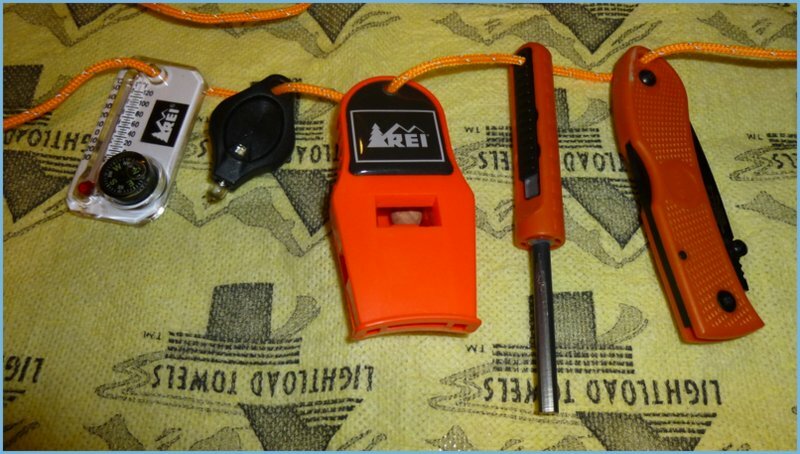 This is actually one of those cheap REI thermometers which includes the tiny compass as well as a wind chill chart on the back. Exotac polySTRIKER fire steel. I enjoy using a fire steel for lighting my alcohol stoves, as well, it is an excellent last resort for making a fire. 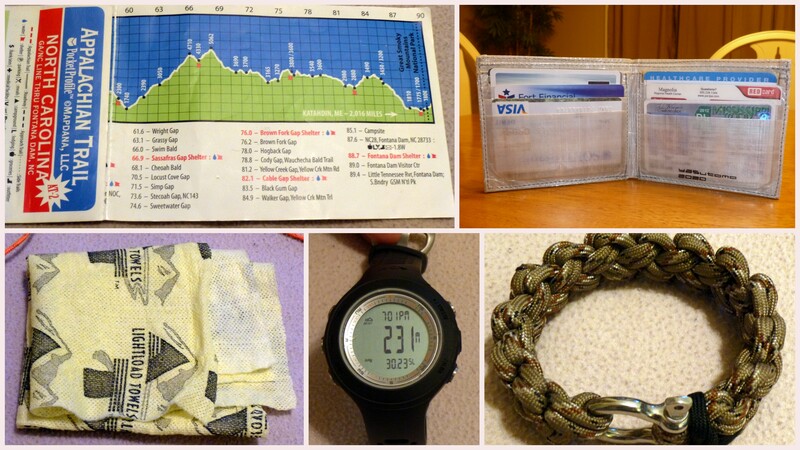 So, these are the items that I have been carrying in my pockets, or wearing on my wrists, for the last few hikes. Having these key items in these certain areas have allowed me to be able to access them fast when I need them, and I do in fact know where they are when the time arises. I like this method for these particular reasons. As well, it is a quick way for me to do a check before breaking camp, or a nice spot I stopped for a quick snack or a lunch. I just pat my pockets and can pretty quickly tell if I have everything or not. So, I am curious, what items do you carry in your pocket’s? This entry was posted in Cord/Rope, Gear, Knives, Lights, Pack Towels, Packing, Wallet and tagged Backpacking, Bleach, Cargo pants, Carmex, Carried Items, Dr. Bronners, Exotac Polystriker, Gear List, Germ-X, Glowire, High Gear Axio Max Watch, Hiking, Ka-Bar mini Dozier knife, Lightload Towel, Map, Packing, Paracord Bracelet, Photon Micro Light, REI Tri Power Whistle, Sawyer Squeeze, Waben Cuben Fiber Wallet. Bookmark the permalink. 12 Responses to What’s In My Pocket’s? Stick….things are good here. Too much work and not enough hikes though. Such is summer when you work in a tourist town. I only made it backpacking once so far, heavy pack! Need to lighten up…or toughen up before I head out again. Thanks for letting me glean from your very detailed posts! I know the feeling… I am on call every other week, year round so it is not extremely often that I am able to get away either… I will take them when I can though! I also know the feeling about needing to lighten up! I decided that a couple of years ago and now I am at a happy weight for me. And it is so much better. Just keeping pecking away at it. The easiest way to lighten up is to leave behind things that are never used. Then look for multiuse items and once this is done, if you still want to go lighter you can begin replacing some of your heavier items with lighter ones. You will get there. Just be sure though, don’t ever sacrifice your safety for the sake of going lighter, and always keep your level of comfort in mind! Anyway, as far as the multipack from ZPacks, I love mine, but I found it to be too hot to use in the summer, at least our summers. During the winter though, it is quite welcome. Really though, it is a very convenient piece of gear. Um, thanks for the view inside your pockets, I guess 🙂 I like the idea of the ziploc with Germ-X, etc because then it’s very quick and easy to access. I agree, having these items in a Ziploc makes getting to them quick and easy, but also, if one were to leak, it would still be contained! Looking in my actual pockets on my shorts…on any given day…photocopy of the trail route from a hiking book/or map, Chapstick, half eaten Luna bar and a small baggie with paper towel for pee breaks. The rest of my stuff is hanging on the outside of my pack (gps, camera, whistle, bear/pepper spray), cloth neckerchief. Good to hear from you, and thanks for commenting and sharing! I used to hang stuff from my pack, but then decided that I preferred to have everything in a pocket, or in my pack. Just a personal preference. Anyway, how are things coming along for you? Is everything coming together for you?